EMF method: This method is also known as synchronous impedance method.Here the magnetic circuit is assumed to be unsaturated. In this method the MMFs (fluxes) produced by rotor and stator are replaced by their equivalent emf, and hence called emf method.To predetermine the regulation by this method the following information is to be determined.Armature resistance/phase of the alternator, open circuit and short circuit characteristics of the alternator. Here we discuss Voltage Regulation of Synchronous Generator [Alternator] by EMF Method or Synchronous Impedance Method.this is better method than direct loading but not best methods to find out voltage regulation. To perform voltage regulation by emf method we need to calculate the following data. 2.Open Circuit characteristics which is a graph between open circuit voltage [Vo.c.] and field current. 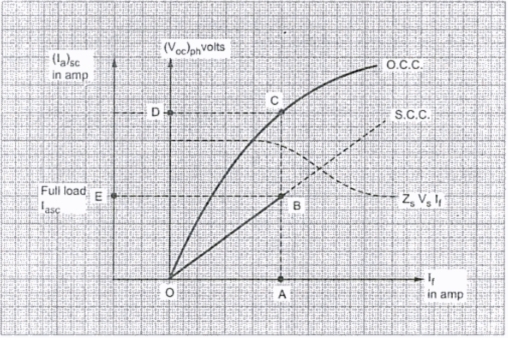 3.Short circuit characteristics which is a graph between short circuit current [Is.c.] and field current. In Synchronous Impedance Method we need to calculate OC and SC characteristics to find Synchronous Impedance.so..follow these steps to find out OC & SC test values. (b) that required to force it through the remainder of the magnetic circuit. The shorter the air gap, the steeper is the air gap line. (i) Start the prime mover and adjust the speed to the synchronous speed of the alternator. (ii) Keep the field circuit rheostat in cut in position and switch on DC supply. (iii) Keep the TPST switch of the stator circuit in open position. stator terminal voltage, till the voltage read by the voltmeter reaches up to 110% of rated voltage. Reduce the field current and stop the machine. (v) Plot of terminal voltage/ phase vs field current gives the OC curve. The short-circuit characteristic, as its name implies, refers to the behaviour of the alternator when its armature is short-circuited. In a single-phase machine the armature terminals are short-circuited through an ammeter, but in a three phase machine all three phases must be short-circuited. An ammeter is connected in series with each armature terminal, the three remaining ammeter terminals being short-circuited. The machine is run at rated speed and field current is increased gradually to If2 till armature current reaches rated value. The armature short-circuit current and the field current are found to be proportional to each other over a wide range, as shown in Figure, so that the short circuit characteristic is a straight line. Under short-circuit conditions the armature current is almost 90° out of phase with the voltage, and the armature mmf has a direct demagnetizing action on the field.The resultant ampere − turns inducing the armature emf are, therefore, very small and is equal to the difference between the field and the armature ampere − turns. This results in low mmf in the magnetic circuit, which remains in unsaturated condition and hence the small value of induced emf increases linearly with field current. This small induced armature emf is equal to the voltage drop in the winding itself, since the terminal voltage is zero by assumption. It is the voltage required to circulate the short circuit current through the armature windings. The armature resistance is usually small compared with the reactance. The short-circuit ratio is defined as the ratio of the field current required to produce rated volts on open circuit to field current required to circulate full-load current with the armature short-circuited. As the terminals of the stator are short circuited in SC test, the short circuit current is circulated against the impedance of the stator called the synchronous impedance. This impedance can be estimated form the oc and sc characteristics.The ratio of open circuit voltage to the short circuit current at a particular field current, or at a field current responsible for circulating the rated current is called the synchronous impedance. 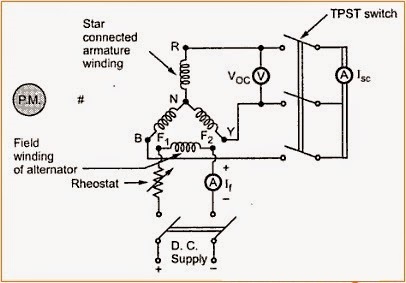 Armature resistance Ra of the stator can be measured using Voltmeter Ammeter method. Using synchronous impedance and armature resistance synchronous reactance and hence regulation can be calculated as follows using emf method. – sign is for leading power factor. where Eph = induced emf /phase, Vph = rated terminal voltage/phase. Synchronous impedance method is easy but it will not give accurate results. This method gives the value of regulation which is greater (poor) than the actual value and hence this method is called pessimistic method. The complete phasor diagram for the emf method is shown in above figure. Tags: Synchronous generator voltage regulation,voltage regulation of a synchronous machine by EMF Method or Synchronous Impedance Method,voltage regulation in alternators.Synchronous Impedance Method pdf,Synchronous Impedance Method ppt.